By default the statement profiler also determines the first line of the current block and the first line of the current statement, and accumulates times associated with those. 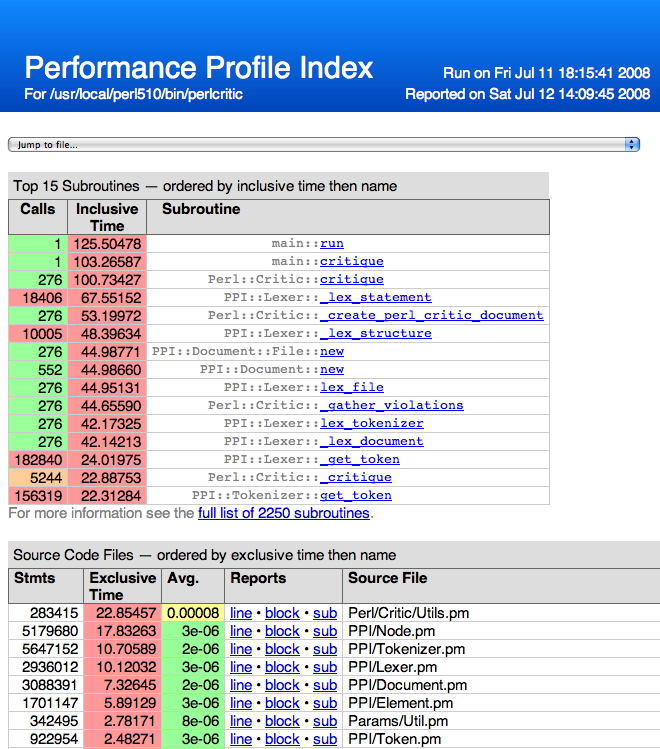 NYTProf is the only Perl profiler to perform block level profiling. Subroutine entry is detected by intercepting the entersub opcode. Subroutine exit is detected via perl's internal save stack. The result is both extremely fast and very robust. NYTProf can profile applications that fork, and does so with no loss of performance. NYTProf detects the fork and starts writing a new profile file with the pid appended to the filename. This avoids concurrent, or consecutive, processes from overwriting the same file. The start=no option is handy if you want to explicitly control profiling by calling DB::enable_profile() and DB::disable_profile() yourself. Set to 0 to disable the determination of block and subroutine location per statement. This makes the profiler about 50% faster (as of July 2008) and produces smaller output files, but you lose some valuable information. The extra cost is likely to be reduced in later versions anyway, as little optimization has been done on that part of the code. NYTProf is the only line-level profiler to measure these times correctly. The profiler is fast enough that you shouldn't need to disable this feature. Measure user CPU + system CPU time instead of the real elapsed 'wall clock' time (which is the default). Measuring CPU time has the advantage of making the measurements independent of time spent blocked waiting for the cpu or network i/o etc. But it also has the severe disadvantage of having typically far less accurate timings. Most systems use a 0.01 second granularity. With modern processors having multi- gigahertz clocks, 0.01 seconds is like a lifetime. The cpu time clock 'ticks' happen so rarely relative to the activity of a most applications that you'd have to run the code for many hours to have any hope of reasonably useful results. A better alternative would be to use the clock=N option to select a high-resolution cpu time clock, if available on your system, because that'll give you higher resolution and work for the subroutine profiler as well. Using the start=no option lets you leave the profiler disabled initially until you call DB::enable_profile() at the right moment. Stops collection of profile data. Subroutine calls which were made while profiling was enabled and are still on the call stack (have not yet exited) will still have their profile data collected when they exit. Enables collection of profile data. If $newfile is true the profile data will be written to $newfile (after completing and closing the previous file, if any). If $newfile already exists it will be deleted first. If you don't need statement-level profiling then you can disable it via "stmts=0". If you do need it but don't mind loosing block-level timings then set "blocks=0". If you want need still more speed then set "leave=0" to disable the adjustments made for statements that 'leave' the current control flow (doing this will make timings for some kinds of statements less accurate). If you don't need subroutine profiling then you can disable it via "subs=0". 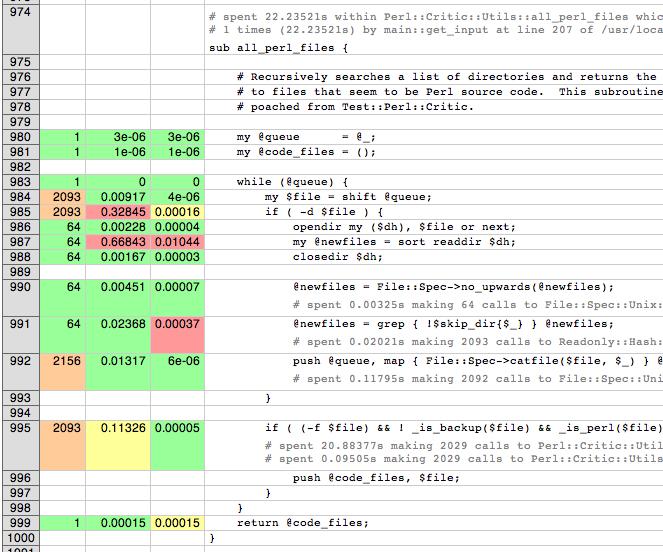 If you do need it but don't need timings for perl opcodes then set "slowops=0". Creates comma delimited profile reports. Old and limited. Creates attractive, richly annotated, and fully cross-linked html reports (including statistics, source code and color highlighting). CLOCK_MONOTONIC represents the amount of time since an unspecified point in the past (typically system start-up time). It increments uniformly independent of adjustments to 'wallclock time'. If your system doesn't support the clock=N option then you could try using the usecputime=1 option. That will give you cpu-time measurements but only at a very low 1/100th of a second resolution. This error message means the file doesn't contain all the expected data. That may be because it was truncated (perhaps the filesystem was full) or, more commonly, because the all the expected data hasn't been written. If the process being profiled has exited then it's likely that it met with a sudden and unnatural death that didn't give NYTProf a chance to finish the profile. If the sudden death was due to a signal then "sigexit=1" may help. If the sudden death was due to calling POSIX::_exit($status) then you'll need to call "finish_profile" before calling POSIX::_exit. Copyright (C) 2008-2010 by Tim Bunce, Ireland. NYTProf stands for 'New York Times Profiler'. Indeed, this module was initially developed from Devel::FastProf by The New York Times Co. to help our developers quickly identify bottlenecks in large Perl applications. The NY Times loves Perl and we hope the community will benefit from our work as much as we have from theirs. Please visit http://open.nytimes.com, our open source blog to see what we are up to, http://code.nytimes.com to see some of our open projects and then check out http://nytimes.com for the latest news! Adam Kaplan took Devel::FastProf and added html report generation (based on Devel::Cover) and a test suite - a tricky thing to do for a profiler. Meanwhile Tim Bunce had been extending Devel::FastProf to add novel per-sub and per-block timing, plus subroutine caller tracking. Then he went a little crazy and added a slew of new features, in addition to per-sub and per-block timing and subroutine caller tracking. These included the 'opcode interception' method of profiling, ultra-fast and robust inclusive subroutine timing, doubling performance, plus major changes to html reporting to display all the extra profile call and timing data in richly annotated and cross-linked reports. Adam's work is sponsored by The New York Times Co. http://open.nytimes.com. Tim's work was partly sponsored by Shopzilla http://www.shopzilla.com during 2008.